The first ever evidence of a comet entering Earth’s atmosphere and exploding, raining down a shock wave of fire which obliterated every life form in its path, has been discovered by a team of South African scientists and international collaborators. “Comets always visit our skies – they’re these dirty snowballs of ice mixed with dust – but never before in history has material from a comet ever been found on Earth,” says Professor David Block of Wits University. The comet entered Earth’s atmosphere above Egypt about 28 million years ago. As it entered the atmosphere, it exploded, heating up the sand beneath it to a temperature of about 2 000 degrees Celsius, and resulting in the formation of a huge amount of yellow silica glass which lies scattered over a 6 000 square kilometer area in the Sahara. 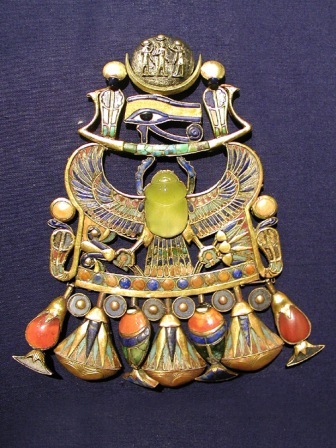 A magnificent specimen of the glass, polished by ancient jewellers, is found in Tutankhamun's brooch with its striking yellow-brown scarab. Kramers describes this as a moment of career defining elation. “It’s a typical scientific euphoria when you eliminate all other options and come to the realisation of what it must be,” he said. The impact of the explosion also produced microscopic diamonds. “Diamonds are produced from carbon bearing material. Normally they form deep in the earth, where the pressure is high, but you can also generate very high pressure with shock. Part of the comet impacted and the shock of the impact produced the diamonds,” says Kramers. The team have named the diamond-bearing pebble “Hypatia” in honour of the first well known female mathematician, astronomer and philosopher, Hypatia of Alexandria. “NASA and ESA (European Space Agency) spend billions of dollars collecting a few micrograms of comet material and bringing it back to Earth, and now we’ve got a radical new approach of studying this material, without spending billions of dollars collecting it,” says Kramers. “Comets contain the very secrets to unlocking the formation of our solar system and this discovery gives us an unprecedented opportunity to study comet material first hand,” says Block.